Dr. Seuss Day (also known as Read Across America Day) is celebrated March 2nd. 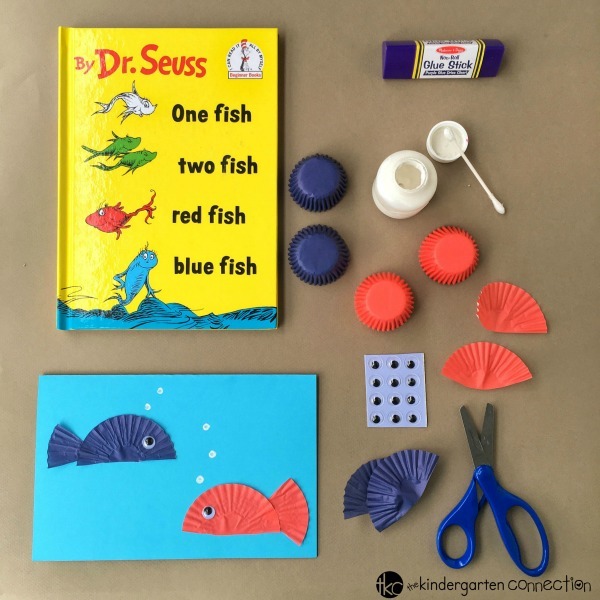 This Dr. Seuss Day craft is inspired by the book One Fish Two Fish Red Fish Blue Fish to make a card decorated with fish! 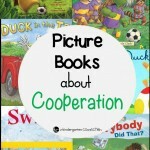 After reading the book, this would be a great project to work on listening skills (following directions), developing fine motor skills, and even a bit of practice using scissors. The best part is that this project uses common craft supplies you probably already have on-hand in your home or classroom. Yay for simple, easy, and fun classroom crafts!! To make the card, instruct students to fold a piece of construction paper in half. Students can use a pencil to write their names on the back of the card. 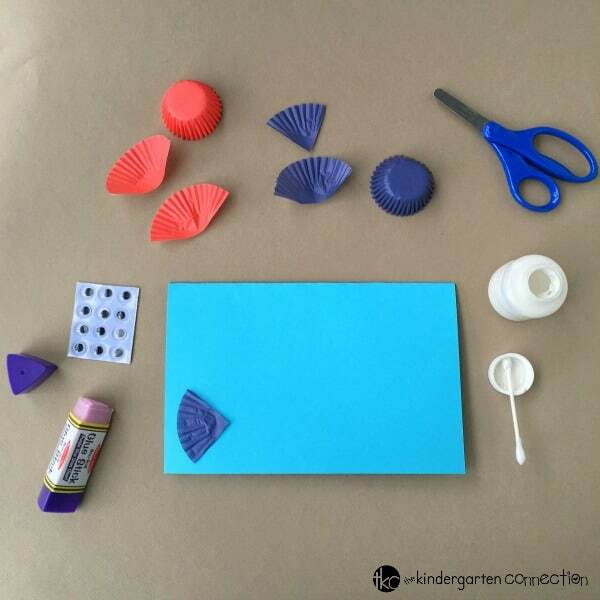 Invite students to fold a mini cupcake liner in half and cut along the fold to form the body of the fish. Fold one of the halves in half again and cut along that fold to form the fish’s tail. Show students how to arrange the fish onto the front of the card and glue into place. They can add a wiggle eye to each fish. To make the air bubbles for the fish, students can use a cotton swab dipped in white washable paint. Allow the paint to dry completely. Once the card is finished, students can write a short message or create a drawing inside and give it to someone special! For another fun invitation to write, you can grab some stickers (even Dr. Seuss themed ones!) and create Sticker Stories!